"Breakthrough" -15-year-old 'Child Prodigy' From Bangalore Uses Conventional Methods To Fight Cancer & Alzheimer's ! Samay Godika, Class X Student is all set to make India proud in the Breakthrough Junior Challenge sponsored by FACEBOOK, GOOGLE & KHAN ACADEMY. He is the only Indian candidate selected for the competition who is now one of the 30 semi-finalists selected from 8,000 entries across the globe. He chose to work on life sciences, the fascinating topic of ’Autophagy’, which also happens to be the 2016 Nobel Prize-winning work. Samay, was born in Boston and is currently a student at the National Public School, Bangalore. 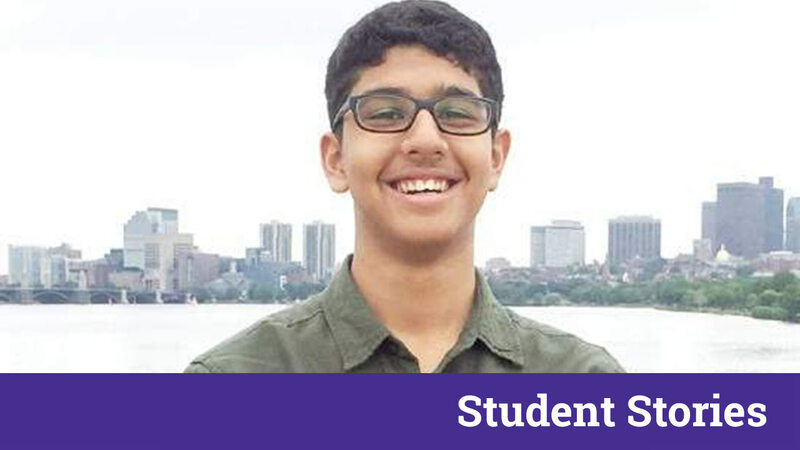 While students at his age find it difficult to manage exams and assignments, this teenager took inspiration from his own family to do something remarkable at such a young age. In his video for the challenge, Samay explains this biological process through a clever combination of humorous animated storytelling and informative scientific explanations. ‘Autophagy’ is the science behind fasting and a topic that would resonate with many Indians as it supports the ancient tradition of fasting to stay healthy and live longer. On much same lines, researchers show that Autophagy, a self-cleaning mechanism, could help fight dreaded diseases like Cancer, Alzheimer’s, Parkinson’s and may even help in Anti-Ageing. The Breakthrough Challenge looks for four main areas that the videos should cover: Engagement, Creativity, Illumination and Difficulty. Not an easy task for teenagers but Samay has managed to cover them all through his hard work. The Breakthrough Challenge is an Annual Competition, with the objective of inspiring creative thinking about science. Students from the ages 13 to 18 from all across the world research, create and submit original videos on complex topics in the field of life sciences, physics or mathematics. The winner gets awarded the prestigious scholarship prize money of $2,50,000 in a glittering ceremony in Los Angeles, attended by the A-listers of Hollywood and the Silicon Valley. Samay, how does it feel to be selected for ‘Breakthrough Junior Challenge’, sponsored by the founders of Facebook, Google and the Khan Academy? It feels really great. I feel very happy, but at the same time, I am looking forward to the next step and stage in the Challenge. I am really passionate about science, and I took up the challenge. The only round before the semi-finals was the Peer-to-Peer Review, where the participants themselves reviewed other submissions and that was really exciting. What are your views on the complex neurological diseases, mankind is suffering from today? In every culture, there is a tradition of intermittent fasting. Turns out, our forefathers were right after all! Intermittent fasting is very healthy, and it accelerates the rate of Autophagy as well. I feel really bad for those who suffer from such diseases, and that is what inspired me to research about preventions for these diseases in the first place. Your video for the challenge is getting great views, what was the inspiration behind the same? A few relatives in my family suffer from neurological diseases. This inspired me to do research about preventions. This is how I came across the topic — Autophagy. It is a process which occurs inside our body, which breaks down dead and decaying organelles, and converts them to energy. If Autophagy is executed regularly, it can have the power to prevent (not cure, just prevent) diseases such as Cancer and Alzheimer’s. What is the main concept/ idea behind your video? “Autophagy makes us more efficient machines to get rid of faulty parts, stop cancerous growths, and stop metabolic dysfunction like obesity and diabetes.” I have explained this concept in my video which is a complex biological self-cleansing process that occurs in every cell of our body. How practical is your concept and do you think it can actually be a solution to the various neurological diseases which are practically impossible to cure? This is not a cure for any disease. If it is executed properly, then it could prevent life-threatening diseases from arising, but it cannot cure any of the above diseases. If we are healthy, then the process is executed well, hence, it is very practical. How hard was it to research and come up with such a simple yet a Breakthrough concept? I met with a Professor and understood the topic completely. Other than that making the script took a while but it was easy to do so after understanding the topic. What are your dreams and aspirations? Do you wish to win a Noble Prize yourself? Who all are your strongest competitors in this challenge and what sets you apart from them? Each person has taken a different and creative approach toward their videos, and all of them are really good. I feel really honoured and proud to be representing India, and happy that I have reached this stage. However, I’m looking forward to the next step, the finals, and hopefully to even winning.